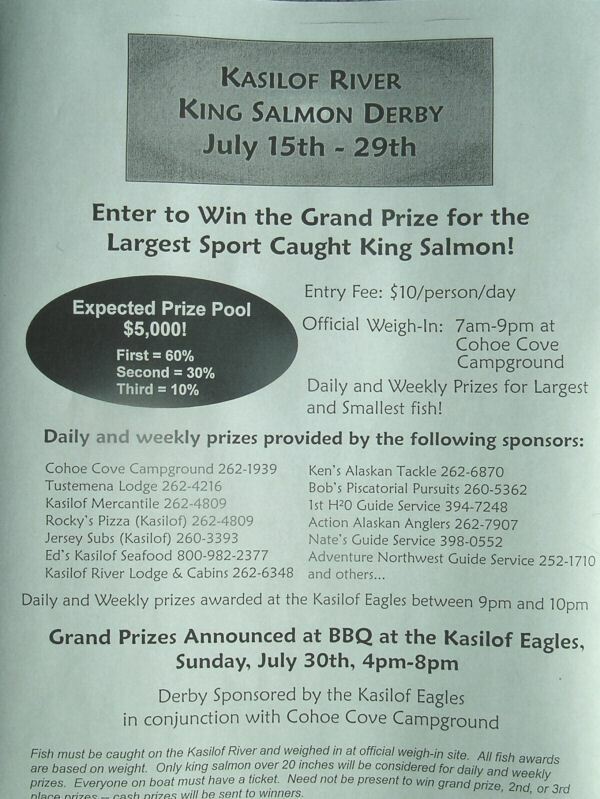 Brought to you by The Kasilof Eagles and Cohoe Cove Campround (amongst the other sponsors as well ). Well, there goes the "best-kept secret of all of the Kenai Peninsula fisheries". And just before I could try it with the "fewer than ten guides that fish the river on a daily basis through the month of July". (Piscatorial Pursuits web page). why do we put more pressure on a fishery that doesn't need it? Being that everyone in your boat must have a entry ticket, I will guess that I won't be entering much, there's almost always one client who does not want to pay the extra fee. Everyone in the boat must enter? I guess the "everyone in the boat must enter" rule is based on the need to meet the dollars required for a reasonable jackpot. What do you do when selling tickets, get everyone together at the boat and sell them so that a person can tell if eveyone is purchasing them or not? I sure would hate to purchase a ticket that was worthless because someone in the boat didn't purchase a ticket. I See That Was For 2006? Am I Right? Is there a recent update? I think folks are just bringing up dead threads from the past, looking at some of recent post ...they must not have to much else to post since the water froze. Must be Cabin Fever already?